In 1998 and 99, I ran windsurfing tours to Plantation Island in Fiji from Sailboard Headquarters in Melbourne. I took a photo on one of those trips of my friend Brendon windsurfing back towards the beach. In the distance behind him is a yacht sailing past a white sandy beach. It was the inspiration behind getting a yacht and running windsurfing charters in Fiji which I succeeded in doing in 2002 with my good friend Mark. Fiji became my second home and is still a highlight in my life. 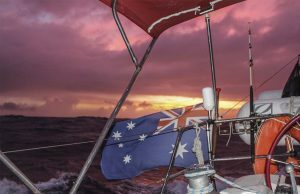 So it was with great excitement that we left Niue, bound for Vuda Point marina near Lautoka in Fiji. Unfortunately, due to funds running short and the possibility of work in Brisbane waiting for us, we had decided to cut our tour short. We had some friends who were keen to come and dive with us in Fiji, however all the reports were that Cyclone Winston had destroyed the diving so we cancelled them and made a promise that we would come back to the Pacific in the next 5 years, preferably 3. We departed early in the morning off our mooring in Alofi Bay, Niue. It was the first time on this trip that we were a little torn. We loved Niue and could have spent more time there, but Fiji was waiting. Annika, and all my family and friends for that matter, have heard so much about Fiji. I have told them many times that Fiji has really nice islands, but you can find them all over the Pacific. What makes Fiji is the people. So Annika was excited to go to Fiji for the first time and see what all the fuss was about. 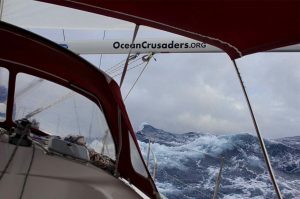 The weather forecast was for 20-30 knots from the south-east, shifting more easterly and easing off the closer we got to Fiji. It’s not the forecast you would usually want to leave on, however we needed to get to Fiji before the wind disappeared completely and turned westerly. So we headed off and the wind shadow of Niue was actually a lot larger than expected. It might be a small island, however it took about 20nm before we finally got into clear air and from there on, the trip was really quick. We actually enjoy sailing in good wind. We could sail with just a mainsail out and get good speeds. We use the mainsail as we have in-mast furling. It’s really easy for Annika to use with a winch to reef it in, or pull it out. It is stable and with a preventer running, the boom will not move. We don’t sail so square that we roll all over the place so it becomes quite easy sailing. 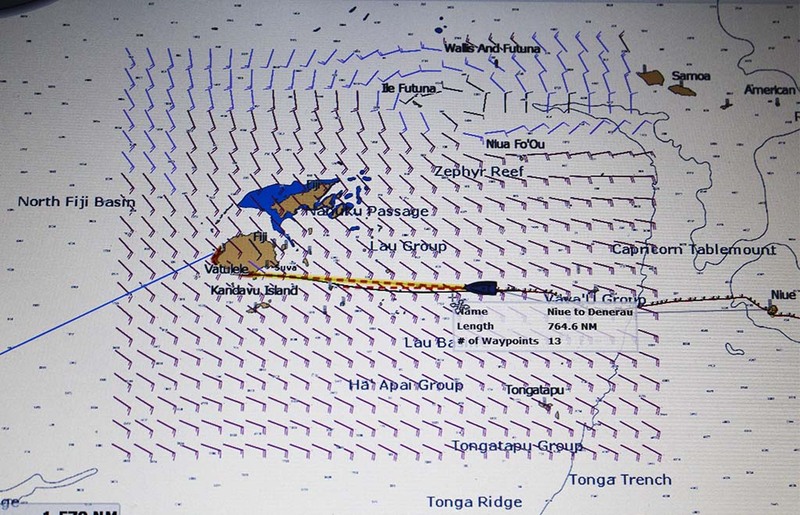 Tonga (Va’Vau Group) is only 250nm from Niue and then Fiji is another 400 odd pending where you say Fiji is. 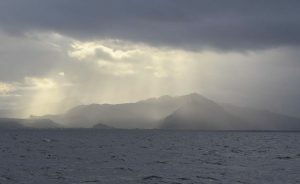 You see Fiji has 333 island and we would sail through the Lau group before getting anywhere near the mainland Viti Levu. Our destination was Vuda (pronounced Vunda) Point Marina which is on the west side of the main island. 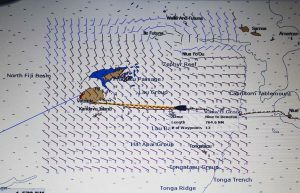 The trip was quick, we got a 6kg Tuna on the way and we sailed around the bottom of Viti Levu in the dark, meaning for a change, we actually had an eta during daylight hours. Along the way between Tonga and Fiji I was reminded of a trip I had done in 2002 with Mark and two other friends. We had sailed across to Tonga to check it out and on the way back we stopped into Suva as it was pouring with rain. We actually sailed past one particular island and a Fijian longboat came flying towards us with guys all dressed in black. They were yelling at us that we were in a restricted area. We had no idea and sailed off away from the island in question. We later found out it was George Speight’s “Prison” island. George was arrested in a coup that he instigated and was put on a tropical island with a golf course as his prison!!! The memories of the days windsurfing the coral coast came flooding back and I found it really hard to sleep. I was just too excited to be back in Fiji. Sailing up around the south west corner of Viti Levu, the current was behind us, the swell had dropped and it was magical sailing. Annika brought us through the reef which is near the location of the famous Cloud Break and I got up just before dawn to bring us across the smooth waters of Nadi and across to Vuda Point. In the distance I could see Plantation Island, the place I really wanted to get to. However being a Friday, it wouldn’t be till Monday that I would be able to get there due to having to gain cruising permits etc. We pulled up at the quarantine mooring out the front of Vuda Point and waited for the marina to call us in. They now arrange the officials to come to the marina rather than having to go around to the shipping port of Lautoka. Just before 1100 we got the call and cruised slowly into the marina. The customs dock is on your starboard side not far past a bar on the point. As it came into view, there must have been 10 locals on the pontoon, all who worked with the marina or the bar. We threw the lines on and then the guitar starts and they all start singing the Fijian welcome song ‘Bula Maleya’. Annika was grinning from ear to ear and couldn’t believe it. Me, well I sat and smiled on the side of the yacht and tried to remember the words. For anyone who has ever been to Fiji, you know the song I’m talking about and it is something really special when after all these years, you hear it again, sung just to the two of us. I was home again. BULA. Now one thing you have to remember with Fiji is that everything happens on Fiji time. If you are in a hurry then you are in the wrong place. You have to slow down and get with the pace of the islands and then everything is sweet. Our health and quarantine people came and inspected everything, taking away most of our fresh food, not that there was much left. We then waited a little longer for the customs people. The cost of getting into Fiji has sky rocketed. Quarantine for the yacht cost us about F$380 and I was still working on the old conversion I used to know where they were only 10% different to the Aussie dollar. It was quite a relief when I found out that the conversion is now AUD65c to the Fiji Dollar. Whilst we waited for our berth allocation we had a drink up at the bar on the point. I had to have a Fiji Bitter, it’s the local beer and when in Rome!!! The service was really friendly and as a cruise ship was in town some of the guests had arrived as part of a tour, the locals were out singing songs, doing hat weaving demonstrations and there was a market for craft. It just felt so homely for me and Annika just loved it. That afternoon we moved into the main marina section. Vuda Point is the cyclone anchorage for the area and the main marina is literally a circle and you all go stern or bow to the wall and have lines all leading towards the center of the circle. It is also a hard stand so it is not the cleanest marina in the world but it was the first time we had been in a marina since Colon Panama. To finally wash the boat with lots of water, fill the tanks with water that is drinkable from a tap and to plug the shore power in was really cool. 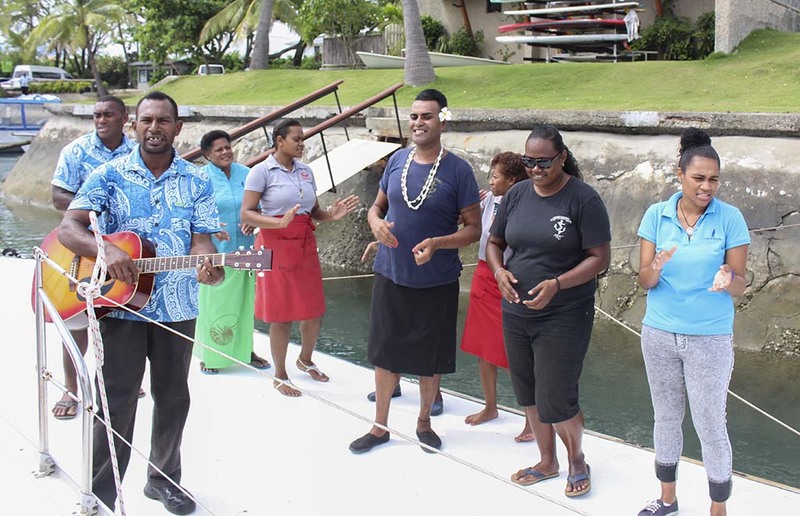 The office staff were typical Fijians. If they weren’t smiling, they were laughing. Every day is a good day in Fiji. This is what Annika had decided was the difference in countries. If the people in the marina were laughing, it was a good place. If they didn’t have the time for you, then we didn’t want to be there. We were pretty exhausted that night, however we were both very happy to be in Fiji. We had the weekend ahead to explore the mainland, do a bit of work to our yacht and then Monday we could get our cruising permit to head to the islands. We had planned to spend three weeks in Fiji, plenty of time to catch up with old friends at Plantation, plenty of time to check out some dive spots and basically show Annika everything I have been raving on about for years. 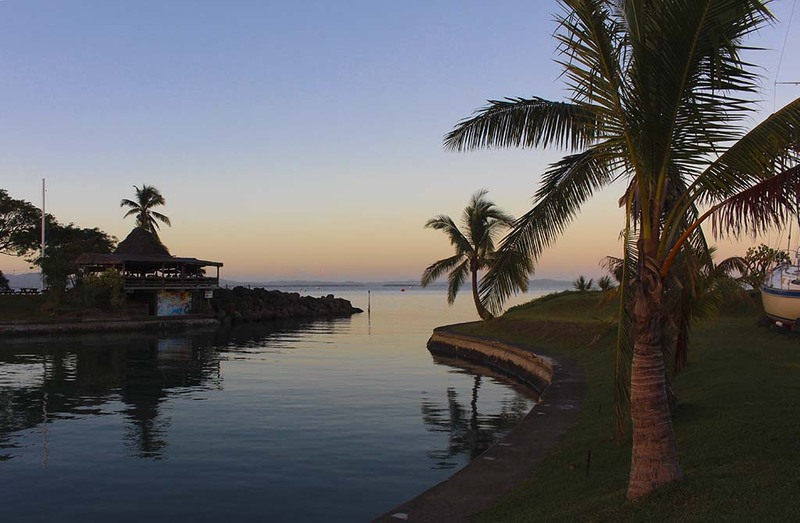 In our next edition we explore the mainland of Fiji.